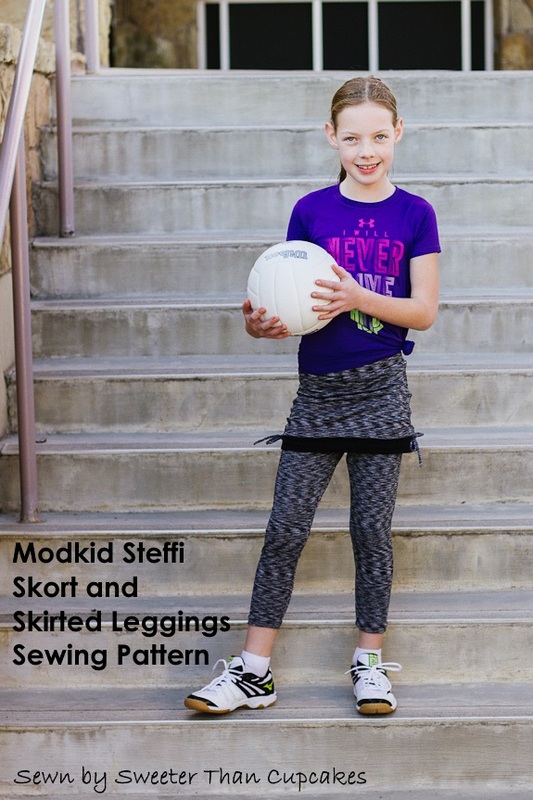 I knew my first pair of Modkid Steffi Skeggings had to be volleyball gear for Avery!! The pattern includes three different skirt styles with 3 different legging lengths resulting in 9 different combinations. How's that for variety?!? Selecting prints, solids, or athletic knits stretches the possibilities even further. Avery's look is completely athletic with spaced dyed spandex from Hobby Lobby. The underskirt is Laguna knit from Imagine Gnats. The side cinching with ties makes this a look I would even wear. My favorite feature is the back coverage offered by the skirt when tunic length tops are not really an option. There is plenty of room for movement at the same time. By switching the skirt style and reaching for some Riley Blake knit prints, Tandy has a completely different look with her Steffi Skeggings. This style would be perfectly dress code friendly, even uniform friendly in the right fabrics. Rolled hems are fast and easy on circle skirts. Adding stretch while you roll gives that extra fun lettuce edge. Of course Tandy's favorite part of any circle skirt is the twirl factor!! Use coupon code STEFFI2018 to receive 40% off your entire purchase, so you can buy other patterns or products with it too. The code is only valid for 24 hours so it expires February 8th at 1:00 p.m. EST. So cute girls. They wear sports clothes look so good.